While frequenting your favourite cafe guarantees a decent brekkie feed (hello, perfect poachies) and exposure to at least 10 outrageously adorable dogs, paying $20 for a meal is kind of ridiculous. Despite what Insta tells you, there's nothing wrong with making your own weekend brunch at home. All you need to do is invite a few mates over (preferably one who has a puppy) and cook up a storm. If you're an egg-for-breakfast kind of person, your go-to at home is probably scrambled or soft boiled, but it's hard to perfect the classic omelette. Either it's under cooked or rubbery. Let's not even go into poached eggs. 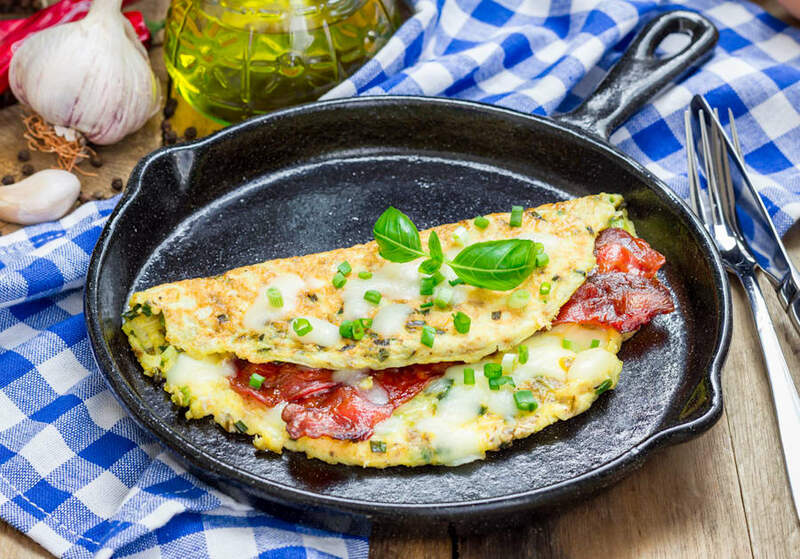 To help you make the best omelette, The Huffington Post Australia enlisted the culinary expertise of PHMG executive chef, Ben Varela, and chef and nutritionist, Zoe Bingley-Pullin. From buying the best ingredients to choosing the right fillings, we've got your brunch situation covered. Both Varela and Bingley-Pullin's top tip for making a killer omelette is using the freshest eggs you can get. "Choose good quality eggs. 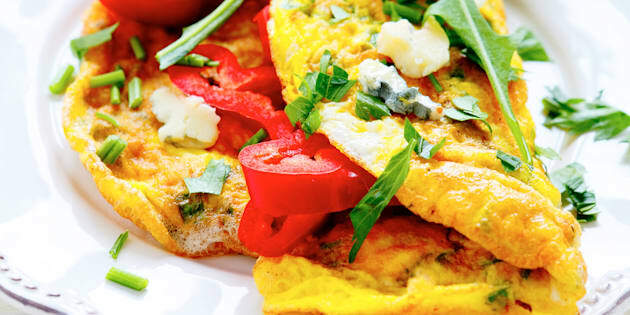 The omelette will then not only taste better but also offer more nutrition," Bingley-Pullin told HuffPost Australia. "Opt for free range organic and locally sourced." "Have a good quality nonstick pan and your ingredients ready to go," Varela added. "Use the best quality and freshest eggs possible." Choosing the right oil is also important when cooking your omelette. 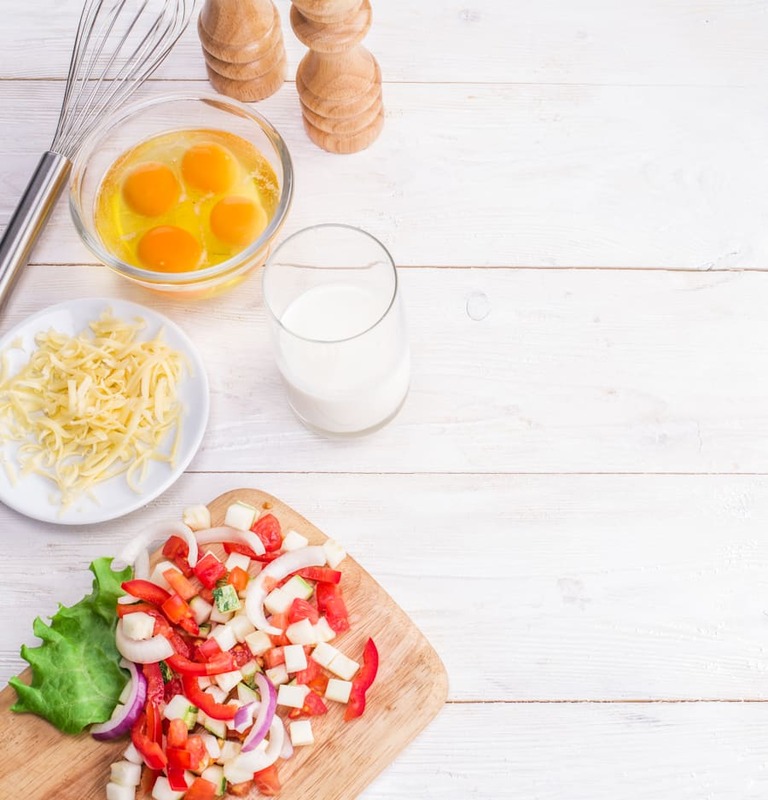 "If you're cooking a sweet omelette, coconut oil or macadamia nut oil is best flavour wise and if savoury, then olive oil or rice bran oil," Zoe Bingley-Pullin said. Varela, however, recommends using butter. "You'll need eggs, butter, crème fraiche, salt and pepper," Varela said. Have all your omelette ingredients prepped to avoid overcooking and burning. When it comes to cooking the omelette, Varela said to be very cautious of the pan's heat. The biggest mistake you can make when making an omelette is burning the hell out of it. "Burning the butter before you add the egg mixture will lead to a brown omelette," Varela said. "Cook it on a low heat, not high, and don't overcook the egg as it will become rubbery." "Watch the omelette carefully by lifting the base of the omelette up with a spatula," Bingley-Pullin added. "You are looking for a lightly cooked golden coloured base, not brown or burned. "Avoid walking away from the pan mid-cooking or you may return to a burned omelette and very dirty pan." Bingley-Pullin also recommends to not overdo it with the seasoning and filling. "Avoid overfilling the omelette, as it will be difficult to flip and get out of the pan without having the omelette burst at the seams," Bingley-Pullin said. "It's tempting to season the egg mix, the filling and then the final product, but with something as delicate as eggs, over seasoning is hard to mask. If you choose to season, season the egg mix and then taste before seasoning again." Now, to fold or not to fold? Or should we roll the omelette instead? "I personally prefer a folded omelette, you get a much nicer, soft fluffy centre," Varela said. Bingley-Pullin recommends looking at what fillings you're using to decide what method to go with. "It's a personal preference and comes down to the type of omelette you feel like or which will best suit the ingredients being used," Bingley-Pullin said. There are endless opportunities when it comes to your omelette fillings. 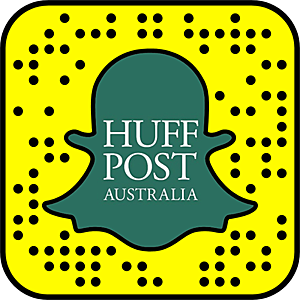 "What you can use is only limited by your imagination," Varela told HuffPost Australia. "You can use mushrooms, tomatoes, smoked salmon, spinach, feta. Crab and sweet corn also works really well with some brown butter as an Asian style dish with some fresh herbs and soy." 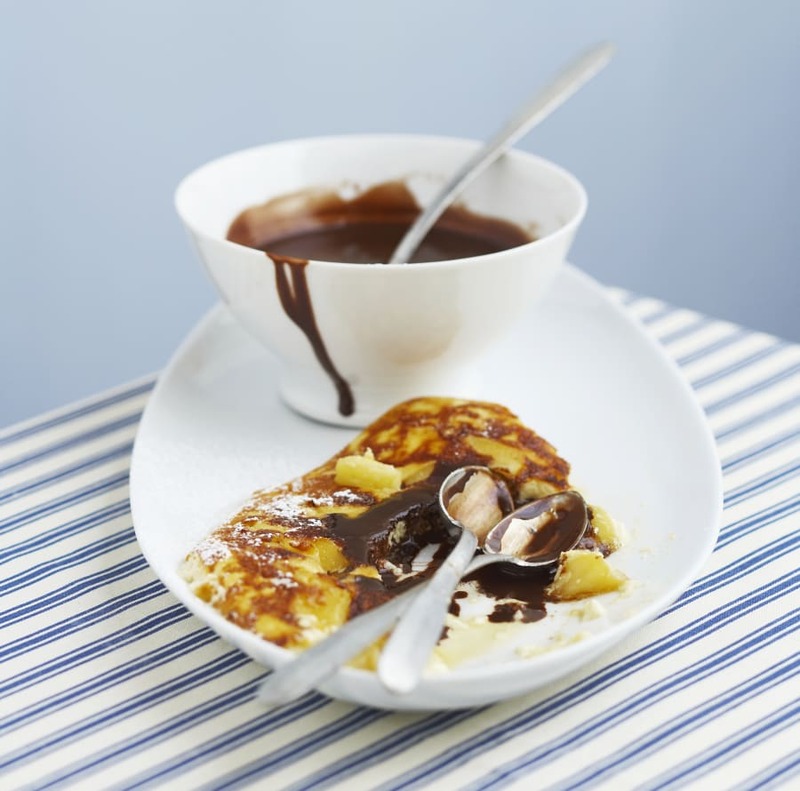 Sweet omelette with chocolate sauce and banana. Heavenly. Ready to make omelettes? 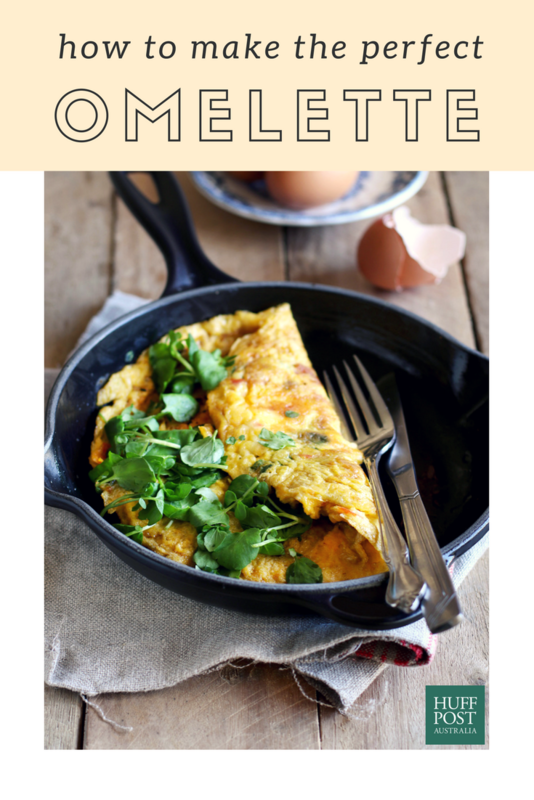 Here are Varela and Bingley-Pullin's favourite omelette recipes. 1. Mix eggs, chives and crème fraiche together. 2. Heat your pan and add butter. 3. Pour your egg mixture into the pan and let the bottom cook slightly. Slowly drag the edges into the centre. 4. Add your salmon and season. 5. Tilt your pan forward and fold from the rear to the front of the pan. Cook until the egg is just cooked through. 6. Serve with a wedge of lemon. 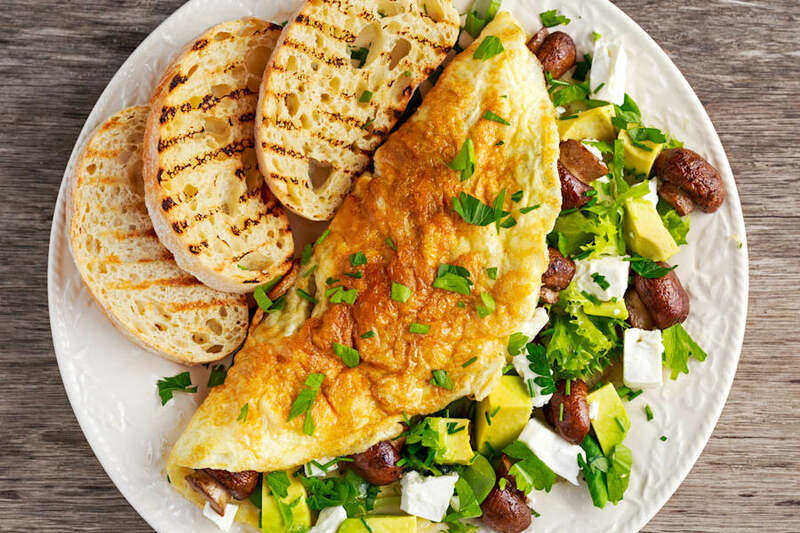 Try adding mushrooms, feta, olives and avocado for a Mediterranean-style omelette. 1. Beat eggs in a bowl and add garlic and tamari. 2. Heat olive oil in a large nonstick frying pan over medium heat. Pour egg mixture into frying pan and spread over surface of pan. When egg mixture begins to set around the edge, fold one corner of the omelette over and roll into a long roll. Roll over to cook evenly on both sides. Remove omelette from pan, let it cool and slice. 4. To make the salad: Steam spinach until wilted and squeeze out excess water. Combine spinach and remaining ingredients in a bowl, and mix well. Serve a slice of the omelette roll with a side of spinach salad.